Volan (?) 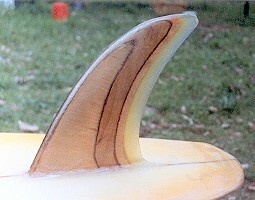 Fibreglassed foam blank, 1/8" redwood stringer, spray, r/h plug. Large G and S Custom Surfboards red/black peusdo-rectangle at sweet spot. - rare, image below. 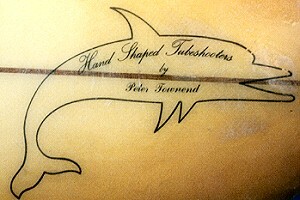 Black dolphin and script Hand Shaped Tubeshooters by Peter Townend, on tail. at left. Bottom: Large Gordon and Smith enhanced script, multi coloured in shield with bird borders at sweet spot.Unusual -Image bottom. Minor ding repairs and fibreglass worn off fin tip. While at Gordon and Smith Surfboards he used/promoted Bonzer designs and asymetricals and was the sponsored Australian surfer for Hollow Wave boards from the USA..
Gordon and Smith Surfboards, 1977.